This is an update of yesterday's Mali conflict map - for the full story, see Mali Map: Islamist Control & French Intervention. Updated map of territorial control and fighting in Mali, as of Jan. 18, 2013. Map by Evan Centanni, modified from Wikimedia map by Orionist, using images by Carport and NordNordWest (source). License: CC BY-SA. 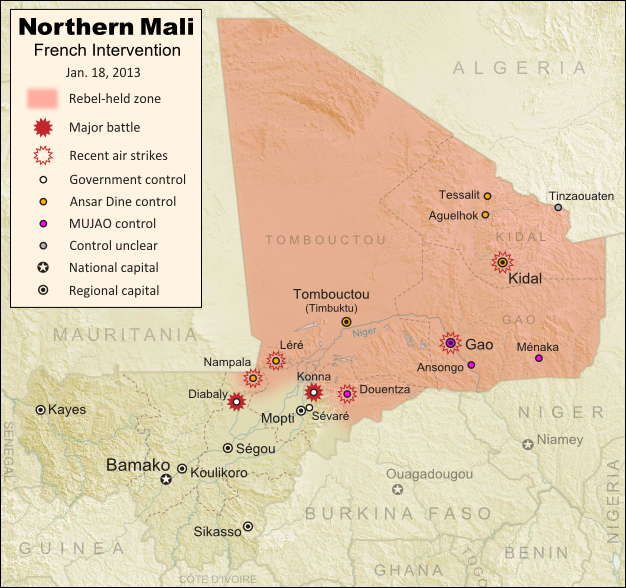 The French intervention in Mali has finally resulted in territorial gains for the government, after the two central towns of Konna and Diabaly were reportedly retaken by French and Malian troops today. Mali had incorrectly claimed the recapture of Konna earlier this week, and Diabaly was actually seized by the Islamic extremist rebels after French forces arrived. Local sources have now confirmed both towns to be under government control. Also today, troops from a Nigerian-led West African force finally began arriving in the country (though they have not yet joined in the combat). Meanwhile, a hostage crisis continued into its third day in neighboring Algeria, where militants closely linked to Al Qaeda have taken over a natural gas field and captured its crew of international workers. By some accounts the militants have demanded an end to the French intervention in Mali, though the location of the gas field is far from Mali's borders, and they are believed to have attacked from within Algeria.